The standard smoothing plane is capable of taking the finest of shavings, even on woods with random grain direction. With their Bedrock design, these planes allow chatter-free cutting thanks to the fully supported blade and a mouth that can be adjusted without removing the cap iron and blade. The rear handle with its width of 26 mm offers a comfortable grip even for large hands. Lateral blade adjustment through easy-to-reach side lever. Cutting angle 45°. 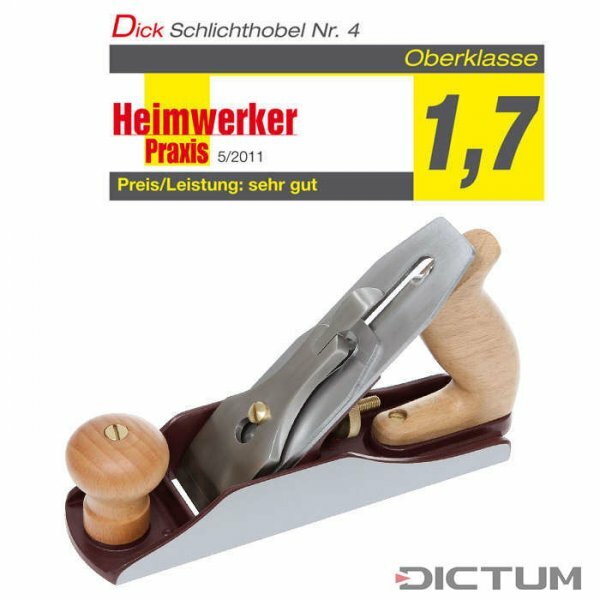 We have developed our DICTUM plane series based on our Herdim planes. We have been making these planes for decades for our violin makers, who require the utmost precision and perfect workmanship. The solid plane bodies made from cast steel* with precisely ground soles aligned at right angles to the sides, together with the minimum 3 mm thick blades made from SK4 steel (61 HRC) signify top quality. The planes are also available with a Japanese blade made of Blue Paper Steel (63 HRC) or an HSS Cryo blade (64 HRC). The blade adjuster allows for precise adjustments and the ergonomically shaped handles developed through tests along with the polished cap irons sit well in the hand. Handles of native beechwood. Fits DICTUM smoothing planes No. 4 (No. 703331 , 703341 , 703359 ) and jack plane No. 5 (No. 703332 , 703342 , 703360 ).